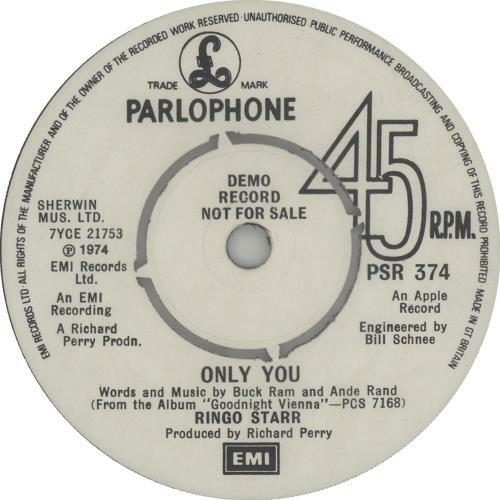 RINGO STARR Interview By Bob Mercer With Ringo For The Salesmen & Uxbridge Road (Extremely Rare 1974 UK white title label promotional vinyl 7", issued to promote the release of the single 'Only You', which features on the B-Side. 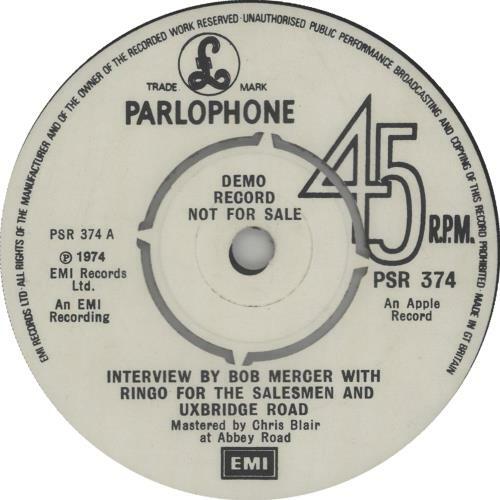 Pressed in very limited numbers, the interview with Ringo by Sales Executive Bob Mercer was intended as a motivational tool to encourage the EMI salesforce to sell, sell, sell! The labels have the four-prong centre intact & there is no writing or much signof play. The matrix numbers are machine stamped in the run-outs & the vinyl grades Excellent with merely the lightest evidence of use. Now a prize item in any Beatles collection PSR374). or visit our Ringo Starr image gallery.